Managed VoIP & Business Analytics for Dentists | Unified Office provids cloud VoIP/UC business solutions for SMBs. Unified Office Total Connect Now℠ with the Total Connect Now Dental Management Suite (TCNDMSSM) is a powerful “Business Class” communications managed service and analytics software that helps dentists and their office managers drive revenue capture, increase operational effectiveness, and create a better customer user experience. The Unified Office voice communications platform is designed to always be available including integrated LTE backup should your broadband or internet suffer from intermittent outages and or quality problems. The Unified Office voice communications platform is designed so that you never get a busy signal so you’ll never miss a call! Our premium quality voice communications uses our patented HQRPTM hybrid cloud network. That means no more garbled voice calls, distorted on-hold messages, or confusing after hours messages! Simplified, easy to configure automated appointment scheduling and confirmation reminders via text, phone calls and emails to your patients will increase appointment conversions. 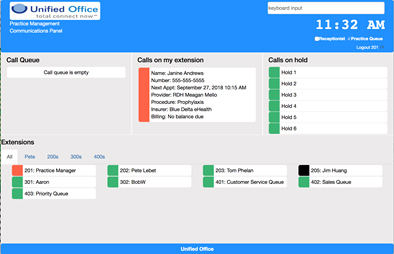 With the Unified Office Operational Management SuiteTM, easily configure and change your practice management workflows as needed, dramatically increasing your staff effectiveness. No more missed hygienist’s appointments that can lead to lost dollars! With Unified Office’s worry free 24X7 premier managed service, we take care of everything for you (install your equipment, manage your broadband, and proactively manage your service), so that you can focus on building your dental practice. Unified Office’s advanced training features and business analytics, integrated with leading Practice Management Solutions, elevates staff performance, practice management, and customer experience.